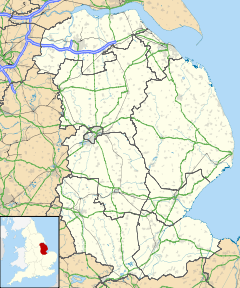 Thornton, or Thornton by Horncastle, is a small hamlet in the civil parish of Roughton, in the East Lindsey district of Lincolnshire, England. It is situated on the B1191 road, 1 mile (1.6 km) west from the A153, and 1.5 miles (2.4 km) south-east from Horncastle town centre. The village is mentioned in the 1086 Domesday Book, with 19 households and Robert the Bursar as Lord of the Manor. The greenstone parish church is dedicated to Saint Wilfrid and is a Grade II listed building dating from the 15th century and restored in 1890 by Ewan Christian. ^ Thornton by Horncastle in the Domesday Book. Retrieved 19 June 2011. ^ Historic England. "St Wilfreds, Thornton (1262381)". National Heritage List for England. Retrieved 19 August 2011.